We need privacy to balance our public, digital lives. I can’t go anywhere without noticing a camera staring me in the face. And as facial recognition software gets better, we’re going to be tracked and monitored everywhere at all times. So, how do we escape this invasive future? We’re moving toward the reality of city surveillance cameras covering every square inch of our cities. New York has plans to add cameras to every tunnel and bridge, China recently installed over 20 million surveillance cameras nationwide, even in my small city of Madison there are cameras lining most streets. Fairly soon, there will be no escaping the “all-seeing” surveillance cameras, considering researchers at the University of Cambridge are creating facial recognition algorithms that detect faces through hats, scarves, and sunglasses. Whether or not you have anything to hide from surveillance cameras is irrelevant. Facial recognition algorithms are advancing to the point of determining personal history, IQ, personality traits, and even sexual orientation. All from your headshot. Would you want your city analyzing your every movement and logging it alongside your personal information? I personally don’t… Where’s the privacy? But, if we can’t hide from these algorithms by wearing Groucho Marx glasses or Palestinian scarves, then what can we do? In response to this extremely invasive possible future, researchers at Carnegie Mellon found a way to “distract” these facial recognition algorithms. 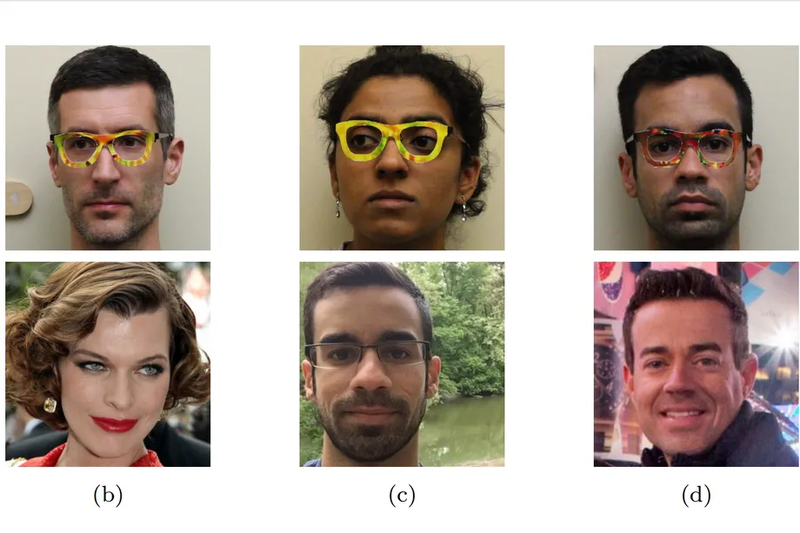 Using a pair of psychedelic-patterned glasses, they were able to not only stop the algorithms from recognizing their faces, but they also tricked the algorithms into thinking they were someone else… All at a cost of 22 cents. You see, facial recognition software doesn’t “see” faces the way that we do. Where we remember people by taking in their full face composition and noticing small distinguishing factors, such as a mole. Computers see our faces as a collection of individual pixels. By analyzing patterns of pixels, they memorize faces. So, when you alter the actual pixels present, you get a different face. Interestingly, the researchers changed the psychedelic patterns in a specific way to get a desired celebrity face. In the eyes of the camera software, they could impersonate anyone they wanted. Thus, creating the world’s first digital disguises. I can see a company in the future that produces digital disguises with a specific face in mind. For instance, you could upload a picture of your sibling and they would produce a pair of glasses that fooled the facial software into thinking it was them instead of you. There’s no reason that these same tricky patterns can’t be stitched into a scarf that covers your face and maybe a hat that distracts the algorithms. Digital disguises could be a huge market. For us normal folk, this is great. We don’t have to worry about a camera invading our privacy at all times and can walk around as Tom Cruise (in the eyes of the camera software). In thinking about the criminal possibilities, this is a HUGE flaw. Your common, everyday robber could transform their identity into anyone they wish and carry out their elaborate criminal schemes. Talk about framing someone for a crime. Digital disguises may turn out to be a facade for privacy if the algorithms learn to get past them. In a way, this reminds me of using an incognito browser on the internet. Although we may think it disguises our internet identity, Incognito browsing just doesn’t save cookies or browser history. It does nothing to mask any information going to or from your computer. Employers, ISPs, and websites can still monitor your activity until you close the incognito window. The real solution is using services such as Tor, which completely masks your web presence. It does this by bouncing your request (and the response) around to a few other servers before finally sending it out in the clear over the internet. Think of it as if you were sending a chain-letter in the mail. You’d send the letter to Bob, Bob to Cathy, Cathy to Dane, Dane to Edith, and Edith to Francis. This makes it very difficult for ISPs to understand exactly what sites you’re visiting and what you’re doing while you’re on them, given the confusing chain of sending and receiving. So, if digital disguises turn out to be like incognito windows, giving a sort of pseudo-privacy. Then, what’s the Tor version that gives us full privacy? Overall, facial recognition has many positives for law enforcement, many negatives for our privacy, and more unknowns that are yet to be uncovered, such as digital disguises. Fortunately, researchers leading the facial recognition charge are finding ways to “break” their own innovations, thus opening up the possibilities. Part of the innovation process is figuring out how to “break” your invention. Whether it’s a project you want to pitch to your company, a funny comic you want to show others, or a point of view you want to share with your friends. It’s important we learn to look at how our ideas can fail, break, and lose. Naturally, we treat our ideas as our children. We are attached and think they are foolproof. Yet, this closes our mind to how others, with a completely different worldview, will perceive our ideas. Every time I create a new idea I ask myself why it wouldn’t work. This puts me into a process of modifying, replacing, and improving ideas until I feel the idea is worth sharing. Practice breaking your ideas before you build them. This will allow you to come at it from all angles, making sure there are few cracks for water to seep out. Feel free to shoot me an email with your thoughts on digital disguises and how you think they can be improved. Quick Theories will resume publishing on January 9th, 2018.